The recent announcement of the details for the NOOKcolor has some people cheering it as the future of eReaders and others groaning at it as a premature gimmick doomed to flop. Obviously, as with most things, where you place it will be based on your needs, desires, and priorities in an eReader. For a long while, the competition was Kindle vs Nook, but the Kindle had an advantage lately that many were hoping would be done away with in the anticipated upgrade this holiday season. Instead, we get a variation that changes the dynamic of the comparison entirely. Still, since the product is here, the comparison must be made! Here’s a preliminary look at how the features stack up between the two most recent incarnations of the competing eReader lines. This point goes to the NOOKcolor. When you think about it, that was rather inevitable. If you have a full color Tablet-PC kind of thing with its own app store, eventually people are going to find a way to open pretty much anything you choose to put on there. I doubt it will do everything well, but eventually everything will be possible at least. That aside, it also comes out of the box as more openly compatible than the Kindle for two reasons. First, and most obviously, you do get a color LCD. That means that the sort of media integration that the Kindle apps boast on other platforms is possible right on the new eReader. Especially good for kids books and travel guides, I would imagine. Second, it will come with the same range of supported standard eBook formats that the previous nook offered, which were already superior to the Kindle’s. No contest, the Kindle gets it. This is one of the most telling points for those skeptical of the new Barnes & Noble(NYSE:BKS) device. In order to power their screen, they lost the ability to go days or weeks at a time without a charge. The Kindle‘s always had a slight edge over the nook when it comes to battery life, but when you’re talking about seven days without charging instead of ten you’re really just nitpicking. It doesn’t matter anymore beyond saying that you don’t charge much. Now, though, the new Nook will require pretty much daily charging if you put it to any sort of regular use. This could be a pain, and will definitely make the device less fun on vacations and such. The Kindle has this one too, at least potentially. One of the more surprising exclusions from the NOOKcolor announcement is 3G compatibility. This is probably one of the most over-talked and under-used features of either the Kindle or the nook, especially since WiFi coverage is so easily accessible these days, but I’ve found that it can be a real pain to not have it when you need it. I wouldn’t say it’s an essential feature. It’s definitely nice to not be paying for it on every new eReader I grab. To not even have the option, however, is a bit disappointing. There are too many factors in this consideration to make it a straight Kindle vs nook comparison. Much as it would be great to say that yes, the NOOKcolor has 8gb of internal storage to the Kindle‘s 4gb and has an expansion slot for more memory, there is the unavoidable fact that with the NOOKcolor you will be concerned with a lot more than how many plain text eBooks you can store. Color documents, applications, potentially even embedded video, they all come with a much greater cost in terms of storage space that might well mean your average user gets far less out of their Nook’s hard drive than they would out of a Kindle‘s unless they are careful. You’re left with considering maximum storage space on the one hand against efficient use of said space on the other. Too close to call. Giving it to the Kindle. This point will cause some debate, but I’m definitely partial to the Kindle‘s eInk display when it comes to reading considerations. That’s got to be the main focus when you evaluate eReaders, in my opinion. The fact that the eInk provides amazing contrast, great readability in any situation you could read a normal book in, requires no backlight, and contributes to the impressive battery life all give it the edge. It might be nice to have access to all the little extras and perks that the color LCD provides, but to get it by sacrificing general readability and accepting eye strain isn’t worth it to me. Not much to say about this. If we decide to set aside matters of 3G connectivity, we end up with over a hundred dollars saved on the $139 Kindle. Point for point, I’ve got to give any Kindle vs NOOKcolor comparison to the Kindle at the moment. It just seems better suited to do the job as an eReader than any pseudo-tablet will be able to for a while yet. I have more respect for something that will do its one job extremely well than a compromise that leaves the essential function wanting in favor of extraneous additions. Maybe what you want is something small to use as a cheap iPad replacement and this is exactly what you were hoping for, but as an eReader, the Kindle is by far the better choice. This week has brought us the launch of a co-branded HP (NYSE:HPQ) and Barnes & Noble (NYSE:BKS) eBook store. What does this bring to the market? Not a whole lot of new insight. The new site, accessible at http://hp.bn.com is basically a new black skin on the same old B&N website. Apparently, many new HP computers will be coming with a link to the B&N eBook store preloaded and may even have the reader software already installed and ready to go. The most important thing to note here is that there seems to be absolutely nothing new happening. Maybe it is simply a branding move to help build the presence as eReader sales wars escalate, but you would expect something a bit more substantial from such a teaming up. The store is the same. The software is the same. The selection is the same. The frequently referenced access to the LendMe technology is nothing more than the same old feature that the software already had. There is not even any effort made to specifically market it as an eBook store; there are still tabs for normal books and DVDs as on the B&N main site. This is all distinctly underwhelming. I suppose they had to come out with something new now that the Kindle has taken the feature lead back with their Collections organization system, but from my perspective this one fizzled. In March 2010, the Nook surpassed the Kindle in sales. So much for all of that hype around the iPad being such a fierce competitor for the Kindle. 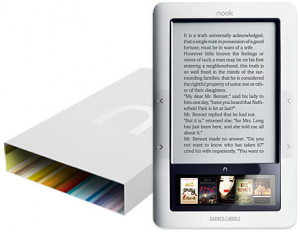 The Nook is Barnes and Noble’s e-reader that includes a selection of over a million titles from Barnes and Noble, as well as books from outside resources such as Google Books. It was launched at the end of November, 2009 with fantastic sales. Such early competition from the Nook is surprising considering that the initial release was flawed. Shipments were delayed and the reviews at the launch were mixed. There were reports of viruses in the e-book downloads. Apparently, the kinks from the initial launch have largely been ironed out. 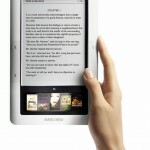 According to an article from Digital Trends, out of the 1.43 million e-book readers shipped, 53% were Nooks. This is good news for both the Nook and Kindle, because it means that the e-book reader market is really taking off on a global scale. The Kindle still holds its status as the veteran of the e-book reader market. E-book reader sales are projected to quadruple from 2009 to 2010, from 3 million to 11 million. Threatened by competition from the Nook and the iPad will hopefully push Amazon to make changes suggested by users and experts to the Kindle, such as price cuts and faster screen reaction times. A big question is whether the Kindle, Nook and iPad will target different sections of the market or whether they will all be vying for the same group of people in the long run. Either way, competition is heating up and the makers of e-book readers will be on their toes. In recent days, as Apple steps into the market and eReaders are practically falling out of the rafters, one of the major points of comparison that has kept the Kindle on top has been the subscription-free 3G connection complete with web browser. Nobody has ever claimed that it looked wonderful, but it does the job and who doesn’t occasionally love the option to check Wikipedia on the fly? Well, it seems that Barnes and Noble has finally caught up with the crowd. According to recently released rumors, we could be seeing a full web browser added into the feature list as early as next week in a downloaded firmware update. Now, it would be reasonable to expect perfection right out the door, but any nook owner will tell you that this has been a long time coming. Even assuming that the main purpose will be for text-based web pages such as Wikipedia or the many online dictionaries, there will be several unexpected side effects that could benefit owners. Travelers in areas without 3G coverage who wish to use their devices in the airport, hotel, or coffee shop have often found themselves out of luck up until now, since many such places require navigating an internal web page to gain access to the connection itself. If this rumor proves true, nook fans have some fun things to look forward to as the eReader feature gap closes up a little bit more. The Banes and Noble Nook eBook reader got updated just before Christmas. So those lucky(?) souls who got theirs delivered before or around that time were able to update their Nook for a comparatively nicer time reading eBooks on their new eBook reader on Christmas. 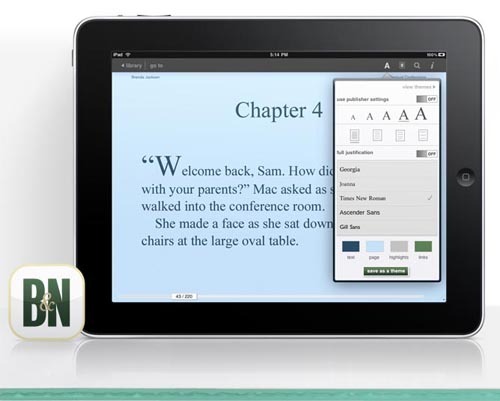 But has the update made the Nook into a killer product, the answer sadly is a no. It still has some time to go before it can threaten established players like the Kindle. In fact, even according to some official words form B&N this wasn’t anything major. They were simply testing things out with their very first over-the-air update for the Nook. Other than allowing a “seamless” access to the B&N store providing exclusive content for the Nook, it also improves on the core speed and performance. That basically means it fixes the things that were slowing the Nook down noticeably. This should also cut down on the number of complaints that we were getting to hear about the Nook. The Nook was already overbooked and supply was low much before Christmas. So most people who wanted to buy and/or gift eBook readers went for the Kindle or the Sony Readers. So the holidays have not made Nook the overnight sensation that some thought it would become. However, do not get me wrong on this count. 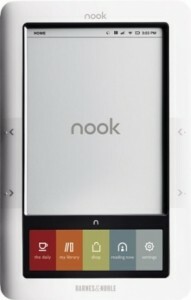 The Nook is actually a very promising device and if B&N can play it right they are in for really good business. 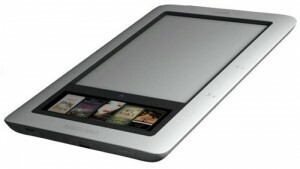 The Nook’s secondary color touchscreen might make more of a difference than originally expected. Plus, the Android factor also works to make it a very powerful device that is also flexible enough to accept radical new features that weren’t thought of before. So hopefully we will see this morph into a really good eBook reader that is different from all the rest. Barnes And Noble has finally started shipping out the Nook, so at least the early birds will be using their brand new Android based eBook reader over Christmas. The rest of you can get a Kindle for Christmas. So what is the Nook user experience be like? Not too great, judging from the reviews. It seems like Barnes and Noble is facing what most companies face when launching a new product — the hiccups associated with a first generation device. There’s always a rush to get the thing out of the door and you know that things have been rushed along. After all, the research lab and the marketing wing has never seen eye to eye on almost any issue for all of corporate business history. So there are features that are missing from the Nook that would likely be addressed by the firmware upgrade that is coming our way soon. The glitches, slow downs and reponse problems are usually associated with software because these things are not caused by the hardware unless something went gravely wrong during initial testing phases. Software can always be pushed out later. All the reviews by popular techies suggest the same thing over and over again — the thing has potential but it is still a toddler and is not ready to face all the ugliness of the world. 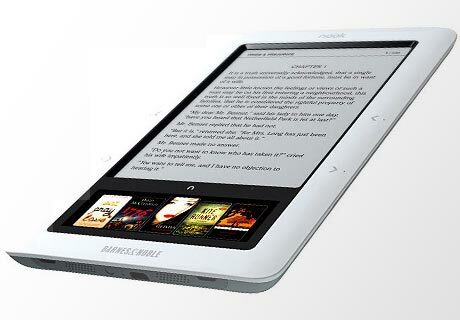 As an Android-based reader there is hope for the Nook yet, thanks to its innovative design. Just don’t expect it to do compare favorably with the Kindle as of yet. The Kindle has had a few product cycles to grow and hence it currently stands out as the best bargain amongst the ever growing number of eBooks. But devices like the Nook will soon make sure that the choice is not that simple. I’ve received an interesting press release this morning from Social Trade LLC about http://ebookchoice.com/. It’s a new website that compares ebook availability and pricing across Amazon Kindle, Barnes&Noble and Sony PRS ebook stores. Personally I think that this website is a great idea. eBook selection is in my opinion the #1 feature of eBook reader. After all what good is an eReader if you can’t read your favorite books on it. 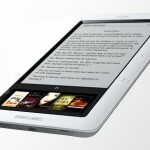 ebookchoice.com gives customers the ability to quickly compare ebook selection before they decide which device to buy. As you can see the coverage for these selected book sets is similar with Amazon having a slight advantage. Of 326 books represented in this table 145 are available on Amazon Kindle, 134 you could find in Barnes&Noble store and 135 on Sony PRS-600. ebookchoice.com did another comparison that included 504 prize-winning fiction and non-fiction books from the past few decades. 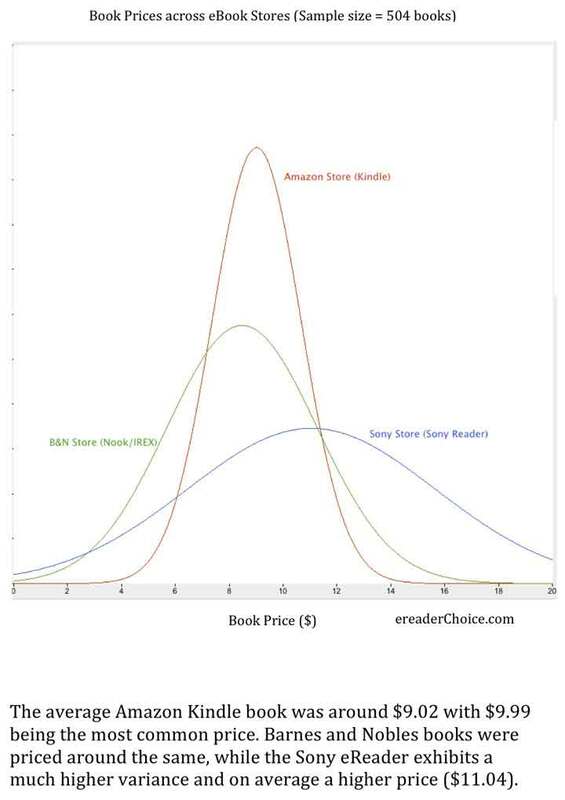 In this comparison Amazon Kindle came out a little bit ahead of the competition as well with 191 books available, followed by Sony with 175 books, Barnes and Noble had 167 books available. It could and should be much better. Ideally the coverage should be 100%. These picture pretty much speaks for itself. 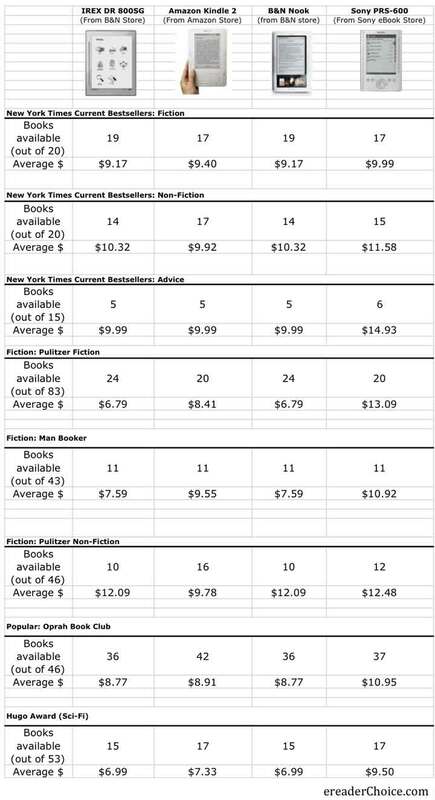 Amazon and B&N have similar average price but B&N has a bit more variance while Amazon sticks to $9.99 price point. Sony is a bit more expensive on average and has even more variance in prices. The website itself is still work in progress though: as I’ve tried to use it this morning, some pages would show MySQL errors and I could only see links to Amazon Kindle books. The coverage is not 100% complete either. I’ve tried searching for Frank Herbert’s “Dune” that I have on my Kindle and ebookchoice.com didn’t have a clue the book existed at all. I believe that these quirks will be worked out with time and the website will realize it’s full potential and become a truly useful and comprehensive resource.